It's Three on Thursday when I list three things and share them with others here at Carol Knits. So, I’m trying to break out of my rut. Have you noticed that I basically live in a rut? I’m Rut Girl. My photos are all taken from the same location. I knit the same things over and over. I never talk about going places or trying new restaurants, mainly because I don’t go anywhere. Yep, I’m Rut Girl. Part of me is okay with it. Actually, a big part of me is okay with being Rut Girl. I like routine. I like knowing what to expect. And yes, I like being able to stay in my pajamas all day. But another part of me is pretty bored with being Rut Girl. So, as of this month, I decided that I would have a new experience at least once a month. At first, I said weekly, but that could get expensive and time consuming. If I have to work too hard at climbing out of my rut, I may not make the effort. So, monthly. Once a month, I’ll experience something new. Visit a new restaurant, go at somewhere I’ve never been before, learn a new knitting stitch or craft, maybe something as simple as trying a new recipe. It doesn’t have to be some major adventure like skydiving, or something expensive like traveling to Europe. Just something different. And because I was kind to my Rut Girl self and set the goal for one new experience monthly rather than weekly, I’ve over achieved already. It’s the third week of September and I’ve already racked up three new experiences! First, I bought, and have been using daily, an Instant Pot. Do you have one? According to the internet, I was the last person on earth to purchase one so I may be preaching to the choir but….. I LOVE my Instant Pot! If you don’t have one, you should look them up on Amazon or simply run to Target like I did. The thing makes perfect rice every single time, in half the time and it never boils over and leaves that icky rice water crud all over the stove. And since it doesn’t boil over, you can walk away and go do something else (like knit) in some other part of the house. Besides cooking perfect rice, you can saute in it, use it like a slow cooker (haven’t tried that yet,) it’s a pressure cooker and it’s a yogurt maker. I’m not sure why anyone would want to go to the trouble of making her own yogurt. For that matter, I’m not sure why anyone would want to eat yogurt in the first place but to each his own. Whatever. The point is, I bought one, I love it, it’s a very different way of cooking and I’ve used it daily since I bought it. Second, and okay, this one isn’t exactly adventurous, but…. I got a flu shot. My very first flu shot ever. Honestly, I’m not sure I’ll ever get another. Good grief! The sore arm after-effect was just about as bad as having the flu. My third new experience is pretty exciting! I bought a new car. Well, new to me. It’s actually pretty old and has obviously been well used by it’s previous owner but hey – it runs well and I paid for it, in cash, with one paycheck! There was even money left over from that paycheck to put gas in it! 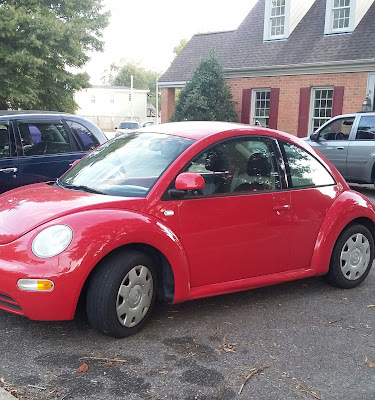 I have wanted a little red Volkswagen since birth. And now I have one! I can not wait to travel to new, adventurous, non-Rut Girl destinations in it. And you know what? For such a little car, it’s trunk is surprisingly large. I will be able to go on some Major yarn hauls! I'm the same way...I tend to do the same things over and over - not in knitting per se - but just in my day to day life. I decided a month or so ago that I need to do something different every month (like you) - even if those different things are simple things to do/go. I've always wanted a VW bug! My parents had one when I was growing up - it was orange. Yippee for you!! Awesome new things you've done so far, how will you ever top them! I'm a fellow Rut Girl and I may take your challenge of one new experience per month! Congratulations on the fun car! I tend to be a rut girl, too, so I admire you stepping out. Your new car in super cute! Congratulations on the new car. It's adorable!